The 260 Sundancer is packed with amenities and options to ensure comfort and every convenience. Savor every minute with the 260 Sundancer. Designed to encourage long, leisurely days on the water with loved ones, it’s packed with amenities and options to ensure comfort and convenience. A convertible V-berth offers cozy napping or overnighting, while a spacious cockpit with ample seating offers endless views of the horizon, the waterline, or the conversation at hand. In the summer, you open all of your home’s windows to bring the beautiful day inside. Why should your boat shut out brilliant sun? Elegantly curved hullside windows and several skylights in the 260 Sundancer transform the cabin into a naturally lit oasis. And with a sliding entry door, you’ll experience better flow transitioning from cockpit to cabin so the sunshine can come inside with you. The 260 Sundancer’s superior drivability is the result of Sea Ray’s unmatched definition of “standard.” With a powerfully rugged 260-hp MerCruiser Bravo® III sterndrive, a fully functional helm, and standard SmartCraft® instrumentation and diagnostics, chart new waters with confidence. After all, easy handling comes standard. Entertaining can be a mad dash or a comfortable afternoon spent laughing with friends. Let the 260 Sundancer’s efficient galley, a blend of elegance and convenience, give you that sense of entertaining ease. 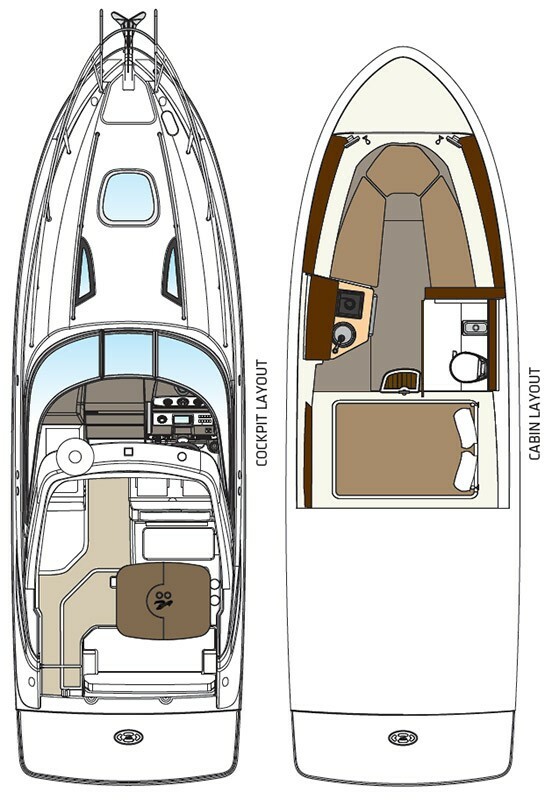 Above deck, a solid-surface countertop wet bar in the cockpit, a helm seat that pivots into the aft social zone and a convertible dinette/sun pad extend that easy hosting into the sunlight. Seating, Port Lounger & storage area.